The elephants at Nong Nooch Tropical Garden joined in as the Najomtien park held a merit-making ceremony to mark 50 days since the death of HM King Bhumibol. 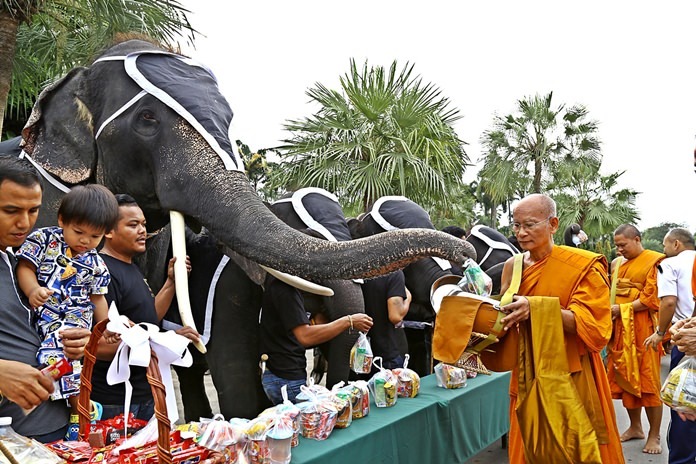 Staffers and elephants give alms to 140 monks from Khao Bampenboon Temple for Fathers’ Day and to mark 50 days since the death of HM King Bhumibol. Director Kampol Tansajja led staffers and nine elephants in giving alms to 140 monks from Khao Bampen­boon Temple Dec. 6. Among the monks were navy sailors ordained temporarily for Father’s Day. Kampol said Thailand was fortunate to be under the reign of a great King for 70 years; one who shaped Thailand and its people with love and devotion with tireless missions mainly for the benefit of Thai people.